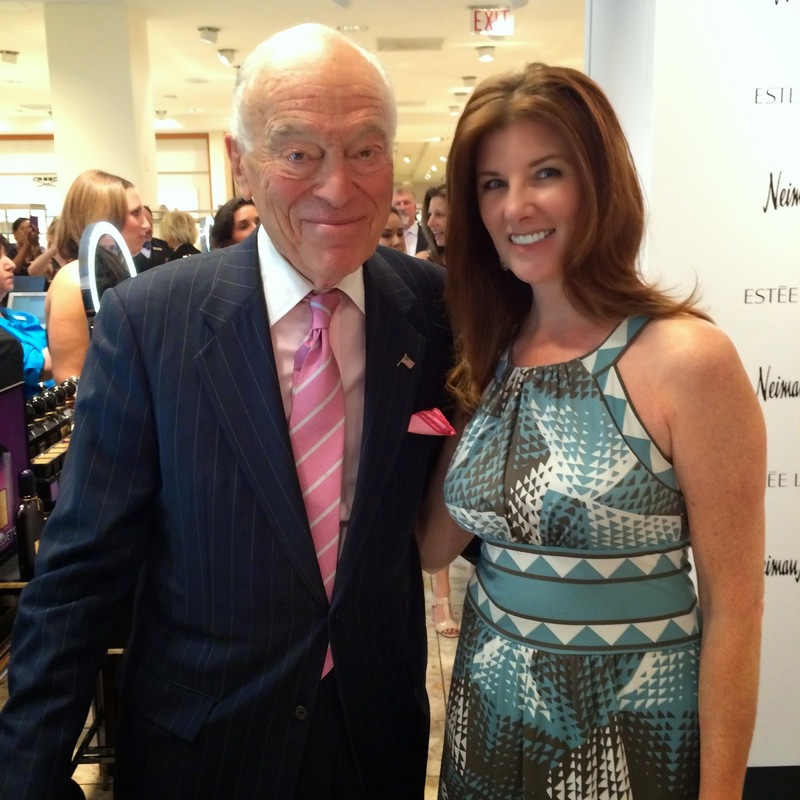 Hundreds of style bloggers, fashion media and socialites turned out to celebrate a new in-store shop for Estée Lauder at Neiman Marcus NorthPark on Wednesday, June 18. Leonard Lauder (Estée Lauder's son and Chairman Emeritus) brought his "traveling companion" international actress, model and brand ambassador Elizabeth Hurley to town just for the occasion. Lauder was just a delight and held the crowd rapt with the story about how his mother came to Dallas in 1950 to pitch her new line to Neiman Marcus. Seems the cosmetics buyer foisted her off onto an assistant buyer. Undeterred by the snub, Estée marched the assistant buyer into the ladies room and gave her a facial and applied her make-up. "She emerged.. glamorous! And if you had seen her before, she was not so glamorous," chuckled Lauder. 64 years later, the love affair between the two companies is still strong. 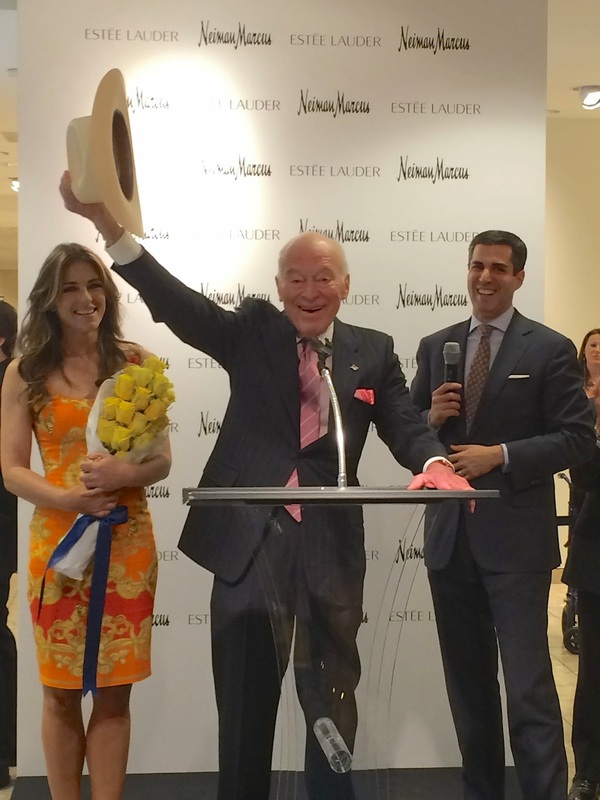 Jim Gold, President and Chief Merchandising Officer of Neiman Marcus Group, presented some Texas-themed gifts to the esteemed visitors: Hurley received a bouquet of yellow roses and Lauder a cowboy hat which gleefully donned. Lauder proclaimed Dallas women to be amongst the most beautiful in the world. "Look to your left, look to your right and you'll see what I mean," he mused. Hey, he'll get no argument from me! A preview of two additional compacts whose proceeds benefit the Breast Cancer Research Foundation (BCRF), founded by the late Evelyn H. Lauder. 100% of the proceeds from the Modern Muse Solid Perfume Compact and 20% of the proceeds from the Evelyn Lauder Dream Compact benefit the BCRF. Thank you to the dapper Mr. Lauder and the Estée Lauder company for gifting me with the ladylike pieces pictured above. It was my pleasure to meet such an icon of the beauty industry (and meeting Elizabeth was pretty cool too)! Visit the new Estée Lauder shop at Neiman Marcus NorthPark to shop this iconic brand.